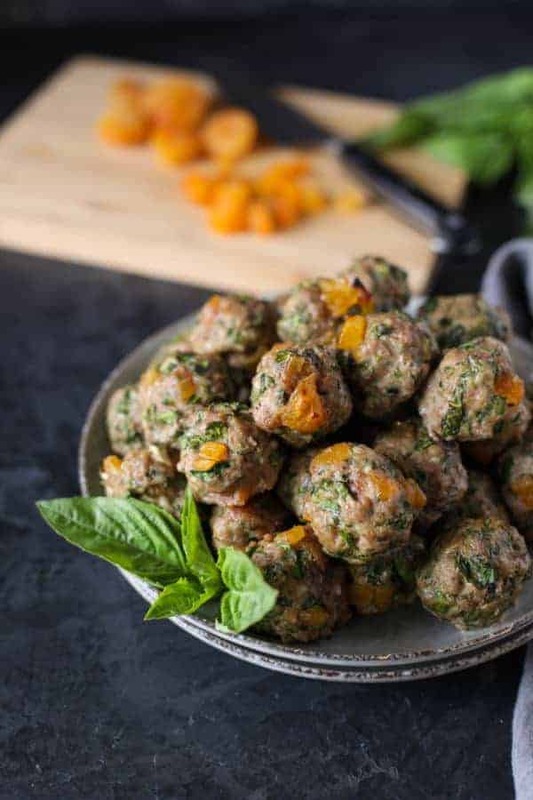 I am now know at my daughters’ school as the ‘meatball lady’ or the ‘meatball queen’ after having served these Apricot-Basil Breakfast Meatballs at several community events in the past year. Totally not kidding here. Blogger by day, meatball queen by night. That’s me! They really are amazing though and after just one bite you’ll see why I’m pseudo-famous for these incredibly delicious little breakfast bites. 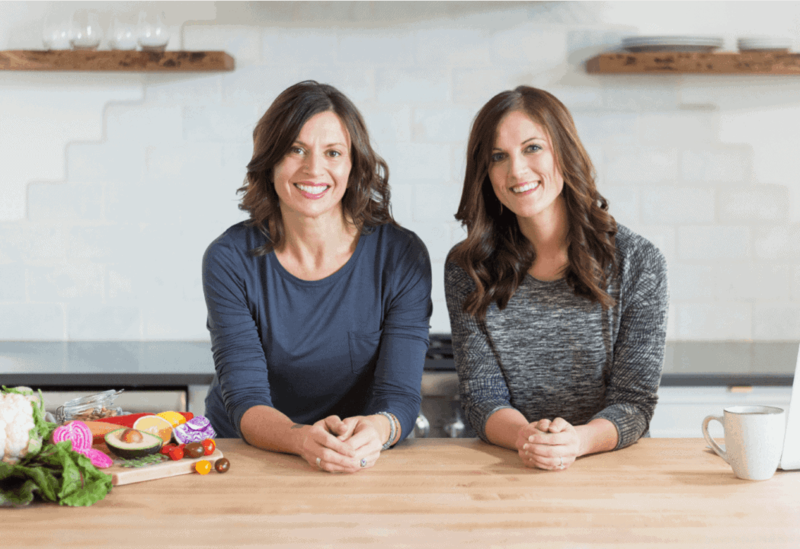 Even though I’m the one basking in all the meatball glory these days I do owe the credit to Stacie for coming up with this recipe for our Spring 14-day Real Food Reboot program (now retired). She jokes that she just ‘threw a few things in the bowl’ and only tested the recipe once but I have to say…she nailed it. And I have an entire community of meatball-lovers to back me up on that one. 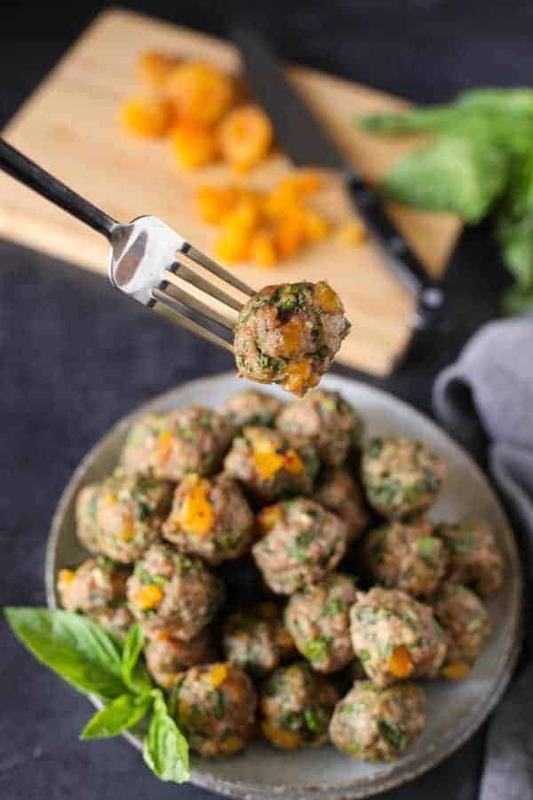 I could wax on all poetic about how flavorful these Apricot-Basil Breakfast Meatballs are, what with their juicy bits of sweet apricot and pungent basil mingling with the garlic…but I won’t. You’re better off just making them yourself. 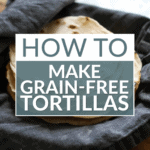 With just 6 ingredients there’s no reason not to. 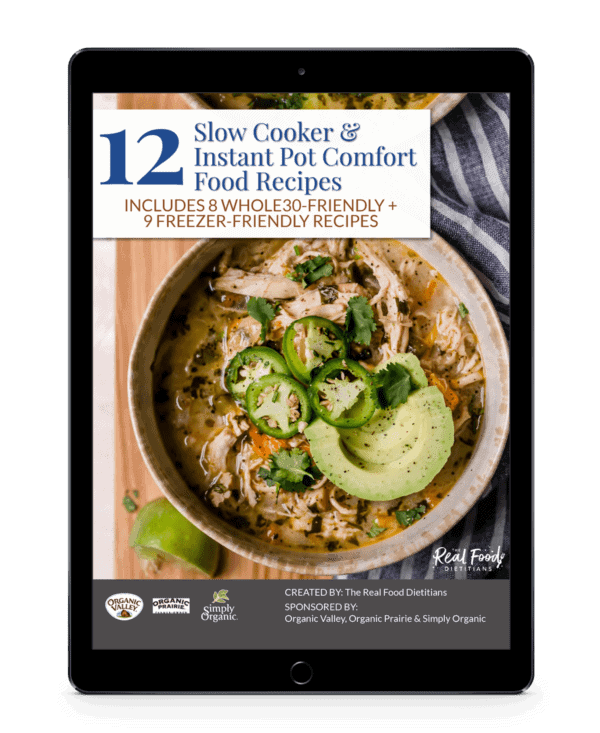 They freeze beautifully so take advantage of bulk meat purchases and consider making a double or triple batch. 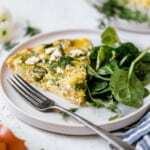 You’re going to love these as an alternative to higher-sodium breakfast links – and they’re made without any added sugar making them a great option for the Whole30 or for those watching their intake of added sugars. And they’re crazy kid-friendly (even with that extra spinach in there). That’s it! Short and sweet — just like the ingredient list. Now go forth and make meatballs! Combine ground pork, turkey, garlic cloves, spinach, basil, salt and pepper. Add apricots to remaining ingredients and mix with hands. 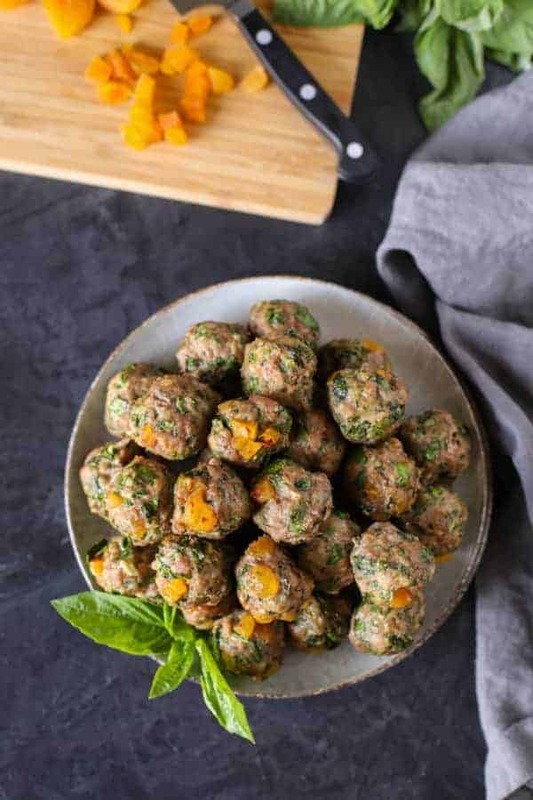 Form mixture into 15 meatballs and place them on baking sheet. Bake in oven for about 13-15 minutes or until cooked through. What’s your favorite unusual flavor combo? How about your favorite way to add protein to your breakfast? Share in the comments below! This sounds delicious!! The instruction say to drain the apricots, but not what they have been soaking in or for how long. Would you please clarify? Thank you! No need to drain the apricots — that was an error in the directions — recipe has been updated! Dried cherries or blueberries are a good substitute for the dried apricots. If I’m going to freeze these, do you recommend cooking them first and then freezing them, or freezing them raw then thawing and cooking? Thanks! 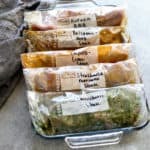 I always cook mine first and then freeze them – that way I can pull out what I need for the next couple days and thaw them in the fridge. 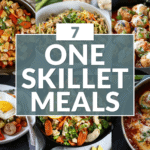 I reheat mine mine by placing them in a small skillet (with lid) with a tiny bit of water over medium-high heat but you could also use a microwave oven. Fabulous meatballs. Unbelievable how moist they are. Never thought pork and turkey fit together but this proves it. I’m making my second batch and they freeze perfectly. Just throw in microwave and they’re just as good as freshly cooked. Yesssss! 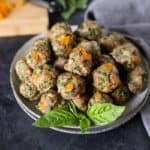 I totally agree, these are one of my favorite recipes on the site and like you, I wasn’t skeptical that turkey and pork would work so well together – perhaps it’s the sweet bits of apricot or the basil? Either way, they’re a favorite at our house as well – and great for parties. These are so delicious!! I’ve made them twice since I discovered the recipe!!! Oh wow are these great! 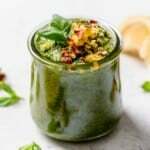 I wasn’t sure about it with so much basil and spinach, but the taste is divine. I used ground chicken instead of turkey, but otherwise made it exactly as printed. I may add in some onions next time but this really is a great recipe. 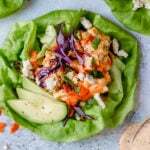 I start my Whole 30 November 1 and wanted to try some recipes out. This is a winner! Thank you. I just finished making these. I made a double batch and plan to freeze them. They are delicious. I got the apricots at Whole Foods (in store) and it enabled me to get just enough. 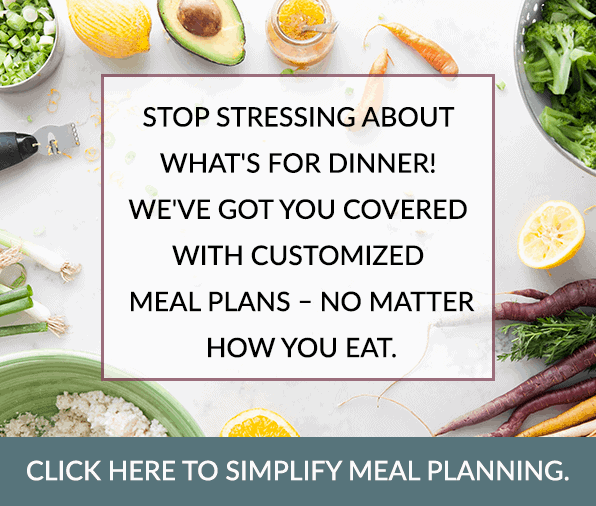 Thanks s much for the wonderful recipes and the comments are so helpful too. 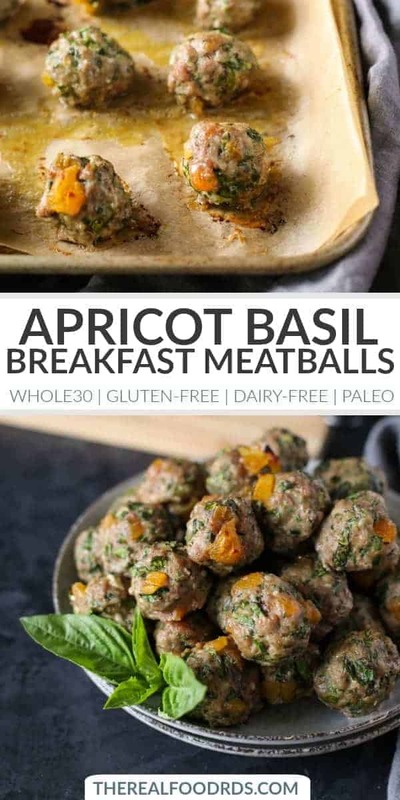 Made these today as part of a W30 breakfast selection – they are so good! I made a double batch (in anticipation of them being great based on comments lol) and will be freezing a bunch for future use. Thank you!! That’s great! I always double the batch too so I have some in the freezer.